GLAD is preparing to fight like hell. 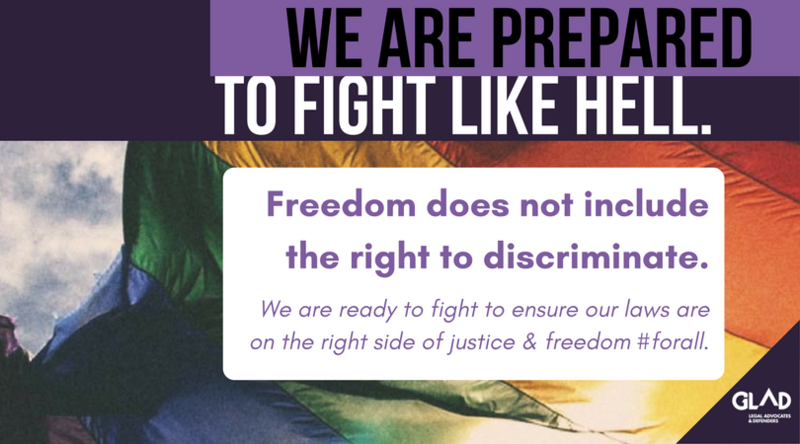 Earlier this week, we saw a leaked draft of a possible Trump administration executive order on “Religious Freedom.” The order targets LGBTQ people, eviscerates women’s healthcare, privileges one religious viewpoint, and offers tax incentives to those who promote it. It is nothing short of a far-reaching license to discriminate. Freedom of religion is a cherished and fundamental right in the US, and it is rightly protected in the First Amendment of our Constitution. But that freedom does not include the right to discriminate. Make no mistake: if this order is signed and its directives are allowed to stand, people will get hurt. GLAD’s lawyers saw this coming, and are already strategizing about how to fight it. We stand ready to go to court to protect the rights of LGBTQ people and our families, friends, and allies who would be hurt by this order. We know so many people of faith agree that freedom means freedom for all – not freedom to discriminate. But we have all seen the hateful tenor of the current administration and their campaign of divisiveness. If a final executive order anything like this draft is signed, we will be ready to fight for all our lives, and all our freedom. But we need your help. GLAD’s lawyers have a 40-year track record of defending and advancing equal justice under the law, from transgender rights, to marriage equality, to ensuring those with HIV can get the healthcare they need. They are strategic, smart, and experienced – and they are fired up. We won’t give in to divisiveness – and we won’t go back. Give now to ensure that we can keep our laws on the right side of justice and true freedom for all.